Here are some high res pictures of a test I did last night for my Leipzig convention battle. This board is 6' x 6' and contains about 2/3 of the units that would be present in the Southern Sector. There's nothing historical about this set-up, as I just wanted to get an idea of the look and make sure everything was remaining unified as I expanded the board. I think it looks nice. The final project will be two times again larger than that you see here. Interesting. What does "a stand" of infantry represent? Each 20mm stand of infantry has 75 figures and represents a French battalion. 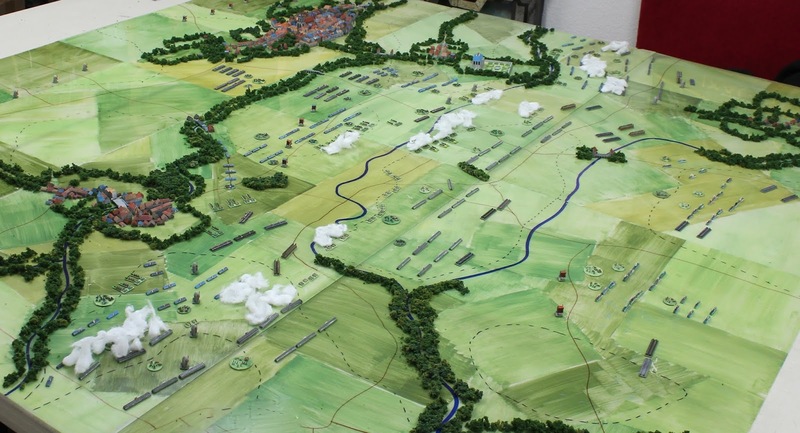 Each 40mm stand is an Austrian battalion and has 150 figures. Each 40mm stand of cavalry has about 60 figures and represents a regiment, although I give each squadron a flag, just to make sure that they're all represented visually somehow. Each artillery battery is on a 20mm stand with two guns. The French all have train models behind the guns, and I'm working on the Austrians (about half way done). There is also a small Russian army at the back of the Austria position, some of whom have deployed to block the French cavalries charge into the gap in the Austrian position. Amazing! What rules are you using? You have given me a great thing to show my daughter's fiance. He just got a 3D printer, knows I am into miniatures and keeps asking me what I want. Now I have a possibility and just what I was looking for (well, I was thinking 6mm, but why not 2mm?). I'm working on two sets for use with my figure range. The first game is the "small game.". It's a fast-play set of tournement rules that use one 36" x 24" panel. The smallest element is the division, which is represented on a 1" color-coded square. It's got a bunch of new ideas in it, especially for Napoleonics. I'm about 80% done with the beta version. It's also good for solo play with no mods required. The other game is the "big game." 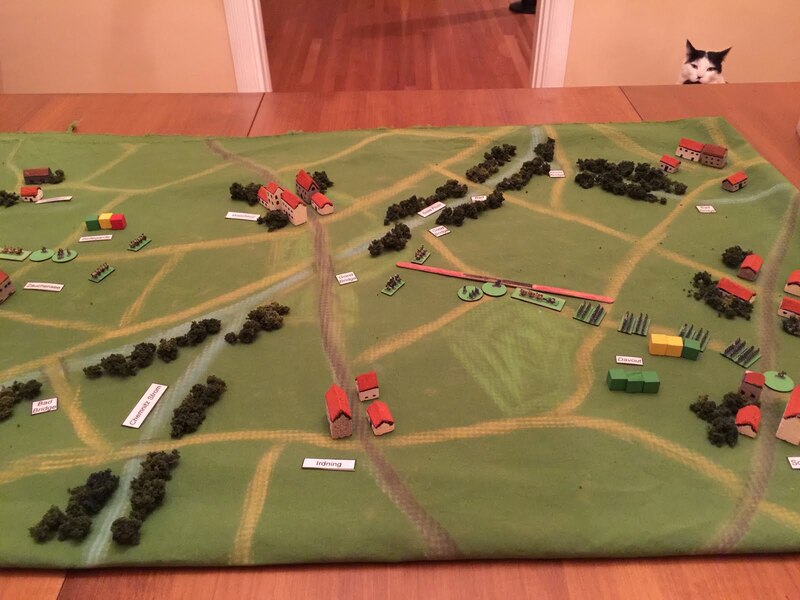 The only set of rules that could probably pull off a Leipzig convention game are BP and Shako, or potentially a very heavily modified Blucher. Even then, it would be a 10 to -12 hour game. There are over 1000 units at Leipzig at my level of representation. The "big rules" are designed to keep the game moving with bath-tubbed combat. You couldn't do this quickly otherwise. What scale is "exact 2mm scale"? I use the term to distinguish my range from other scales and 2mm offerings. 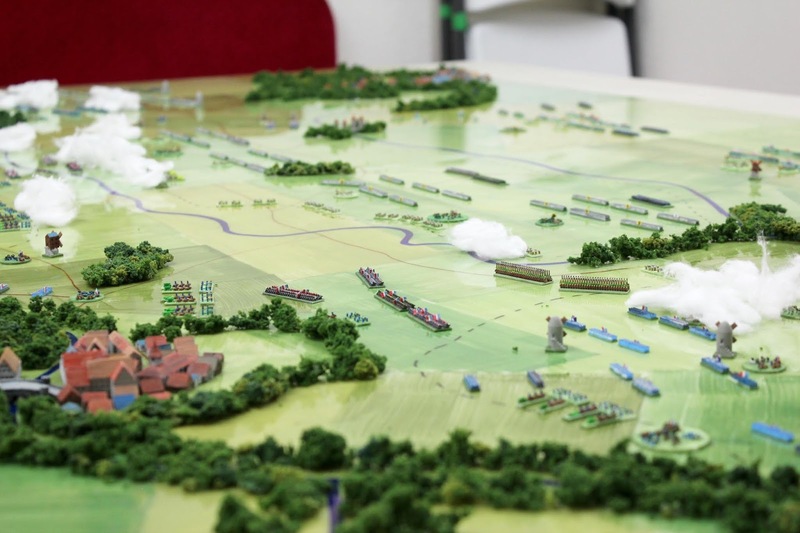 I designed everything for dual gaming/ museum diorama use after seeing the engineering room at Les Invalides. 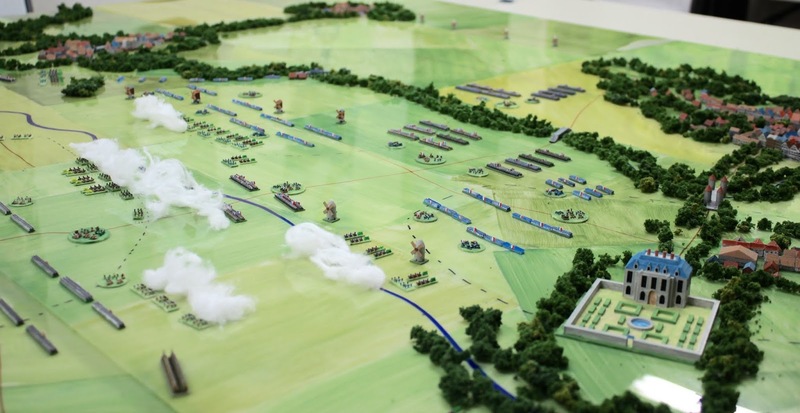 Everything in the picture is designed in CAD, so that each infantry figure, cavalry figure, gun, gunner, officer and building are in scale to each other at 1mm = 3.'. 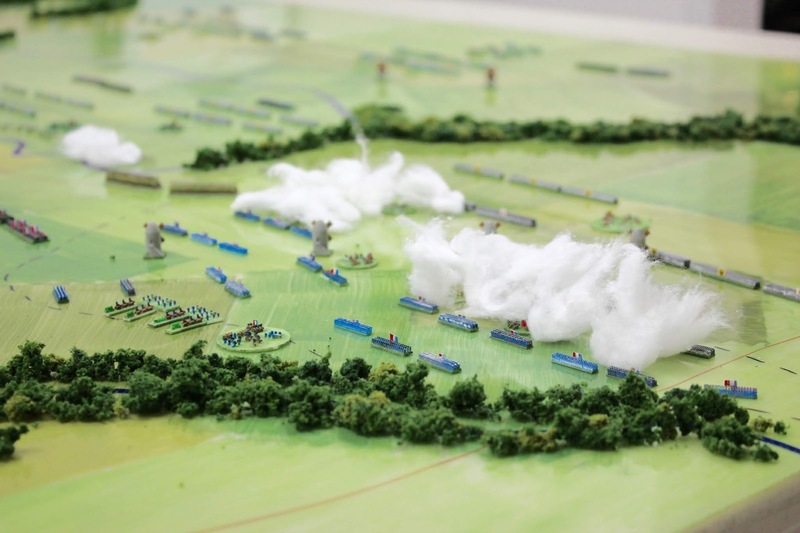 This allows you to, say, recreate Waterloo at 1:1 figure scale AND 1:1 groundscale, something that other figure ranges physically can't do, as the figures tend to be too wide. And obviously as far as physical space and cost goes, they'd be impossible. If you have your own low-end 3D printer you could print out both sides at Waterloo at 1:1 for under $1,000 USD ( I'm guessing; it's probably less). The buildings are all at scale too, so you could make a model of Brussels from the Ferraris maps (or the village of Wagram from the Military Studies) at 1:1 scale -and it would be portable, cheap, and feasible to do so (I need to flesh out the building range though, haha – I am working on new stuff constantly but am also in law school so my time is stretched pretty thin!). meant to be a quick and dirty abstract but it has always looked like fun. The final project will be two times again larger than that you see here. FMS you are one crazy guy! How many players will you be having for the full size game? Good question! Probably a dozen or more. I was thinking about running it in shifts even, with multiple sessions on the same board. Each player would have a mission assigned to them at the start of the game during a conmittee of all the players on that side. That Baccus game is a classic; its not too different from my "small game" aesthetically. I've been meaning to get some Baccus figs to photograph with my buildings. 3mm stuff definitely works. There are a lot more 6mm players than 2mm … for now ; ) … and they might be interested in doing something with my figs. My "small rules" will work with figures up to 10mm, so we'll see how that goes. For the convention I would place unit placards by each division general and corps commander to keep things straight. And maybe write down the names of the regiments at their start positions (being able to jot notes on the map is another great advantage of using plexiglas panels). Thinking on a post I just made on another thread, do you have a cat? Well to the idea of him "communicating his displeasure" part that is. I just had a visions of one of my pests wandering over your set up. It's hard enough to keep them off my painting table! Here's a picture of easily my worst idea: an on-table "analog computer" that kept track of whether or not your subordinates were following orders. You "programmed" it by writing an order with way-points and actions, then it would progress from turn to turn by storing green, red and yellow blocks. Neither player would know exactly where unseen units were until a triggering even happened, then all of the blocks would be resolved in chronological order. The colors indicated the target dice number needed to succceed on the turn they represented. It worked but you ended up managing the system more than playing the game. Anyway, that's all to say that the picture above was a very complex experiment. You can tell Dubs is all mad about needing to keep written orders. About five seconds after this picture was taken he jumped on the table and slid the mat half-way off. Just ordered FMS's catalog of files & printed some tests out in PLA on my Prusa. I'm up to over 220 (possibly more) files at this point (I haven't counted in awhile). I just uploaded another dozen or so over the last day or two, so if you haven't checked out the Library since then you might be interested in taking a peak. There's a new castle wall system (which I'll be expanding), and a bunch of highly detailed Napoleonic infantry company models. Plus I just put out a Beta of some lancers which I think will made some people happy (I just ordered an entire regiment of them; after I check how they came out I'll remove the Beta designation). Anyways, glad to hear you like the range, and if you get a chance to post any painted samples I'd be interested in seeing them.